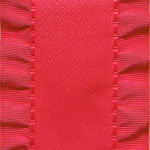 Double Ruffle Ribbon: Virtual Pink. Please select a size and add to cart. Double Ruffle Ribbon is available in widths ranging from 3/8" to 1 1/2".